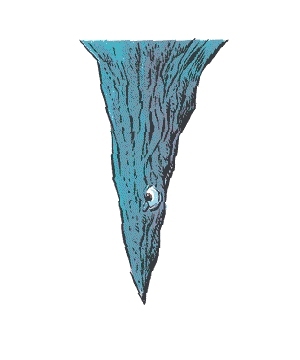 The first time I flipped through my original Monster Manual, the Lurker Above was the first monster I remember stopping at in awe of its sheer majesty. The black, manta-like shape descending on a hero with its odd, beady little insect-eyes was instantly appealing to me, and still feels like one of the game world's most iconic, classic creatures. 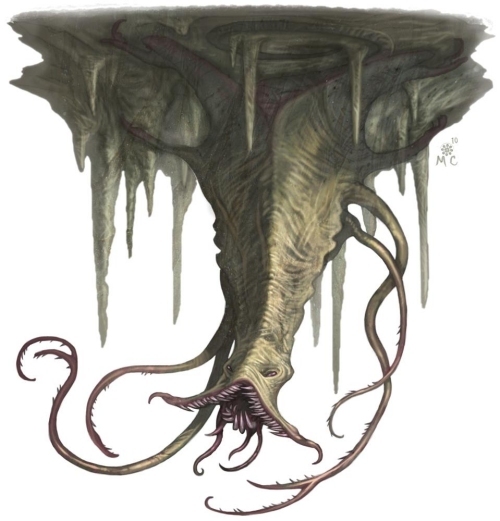 With a stone-like underbelly, the lurker blends in completely with the ceiling of a room or cavern, dropping down on prey which it wraps around and digests alive. 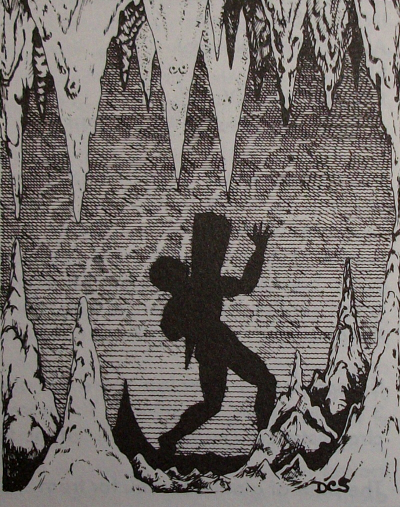 In that same marvelous book was the Lurker's flightless cousin, the Trapper, identical to the Lurker in almost every aspect, except that it attacked from below by imitating a floor. I thought the relation between the two was really cool as a kid, though I suppose the distinction never felt entirely necessary, when a trapper could just as easily be a Lurker lying on its back. 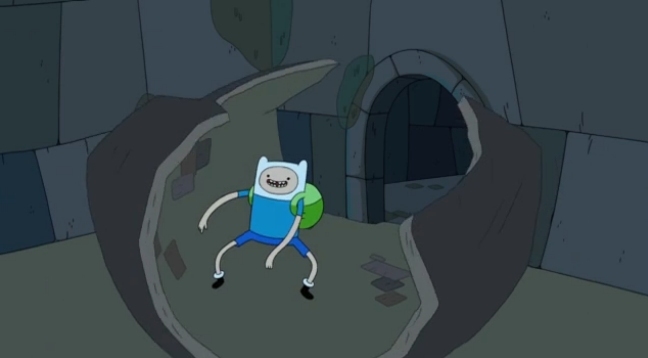 Still, I always enjoyed both illustrations, even if the Trapper doesn't have any cute little fly-eyes, and the Trapper even makes a momentary cameo in Cartoon Network's Adventure Time! Though unrelated to the Lurker or Trapper, the Piercer had a roughly similar hunting technique, and will be more relevant to trappers in a moment. This is another one I'm very fond of, but can somewhat understand why gamers have poked so much fun at the idea. 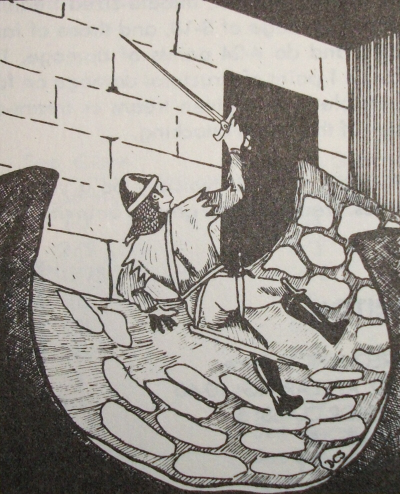 The Piercer is essentially a carnivorous snail that looks exactly like a stalactice, clinging to ceilings until it can drop on passing prey, which is fascinating from a speculative biology perspective, but in-game, doesn't function any differently from real stalactites shaken loose by player footsteps. You have to feel a little bad for a monster whose entire life could be replaced by a rock. Later came the Monster Manual II, which brought us two new Lurker-like monsters. The Miner here was explicitly related to the Trapper, but lived above ground where it concealed itself just under soil or leaf litter, exposing only its venomous back spines to paralyze unwary travelers. 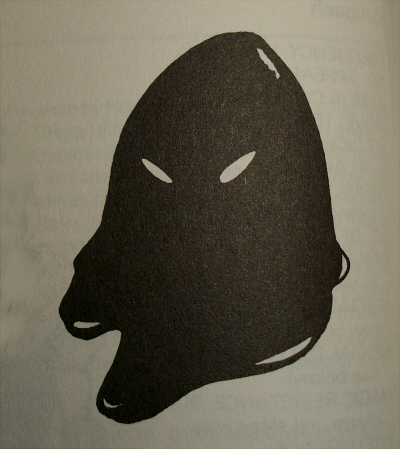 The oft-mocked Executioner's hood, on the other hand, wasn't mentioned as a biological cousin to the Lurker, but was stated as hunting in the same exact fashion, albeit too small to engulf more than its victim's head. 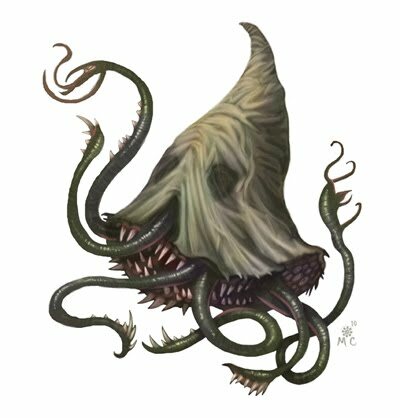 I actually thought this was a scarier concept than the Lurker, since this thing could hide just about anywhere before dissolving your face off. Cutely, they were said to have a vulnerability to alcohol, becoming too intoxicated to hold on to their victim. Actually referred to as a Mollusk, I'm reminded of how beer can be used by gardeners to attract slugs and snails, who get drunk enough to fall in and drown. 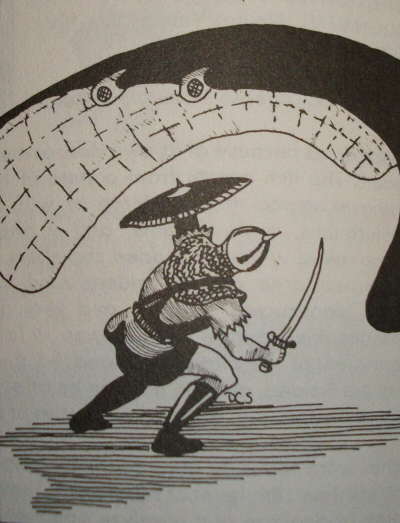 Both Lurkers and Piercers reappeared in the Monstrous Manual, but with illustrations nowhere near as dramatic as in their debut. The sad, stiff looking lurker seemed like hardly a threat, and has to have been the hastiest drawn image in the entire book. Anybody could draw that thing. It's little more than a nondescript hunk of some sort. It's doubtful that this could have won the monsters any new fans, and would be one of the last times they were published as-is in official Dungeons & Dragons materials. 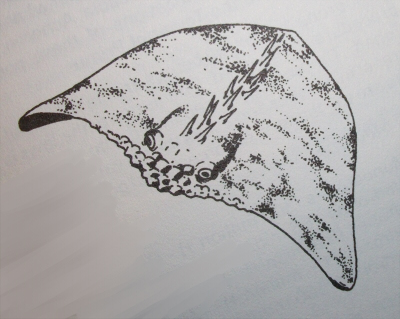 In the 3rd edition Monster Manual, all of these murderous ceiling-dwellers were discontinued in favor of a single rather interesting compromise, the Darkmantle. Like the Lurker and Executioner's Hood, this shadowy cephalopod could levitate, leap from the shadows and engulf prey in its membranous webbing, but like the Piercer, could disguise itself as a harmless cave formation. Further, the Darkmantle was even implied to be an evolutionary relative of the piercer, out-competing them for prey until the poor, pointy snails were all but extinct. 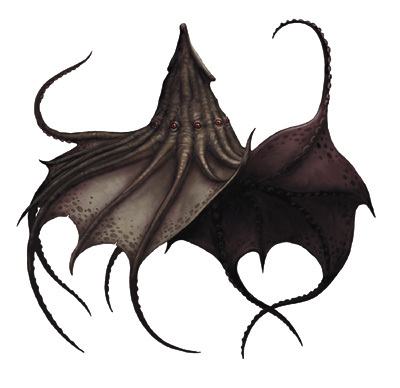 It's cool that they made an effort to actually rationalize this "revamp," and I have to agree that combining the traits of several similar monsters has a pretty cool outcome, especially with its resemblance to a vampire squid. 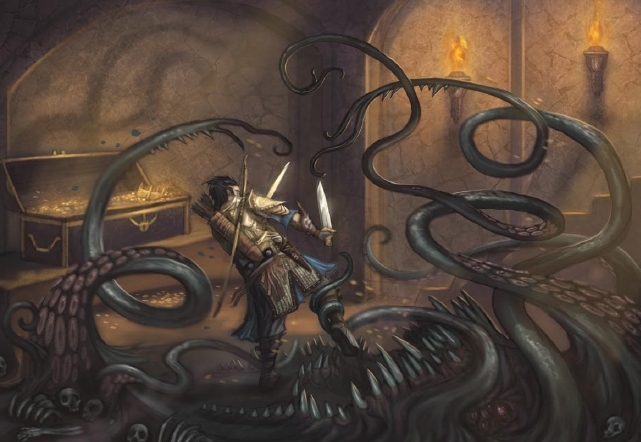 The Darkmantle would be completely one-upped, however, by the Pathfinder game system, an alternative to 4th Edition Dungeons & Dragons by the independent Paizo Publishing. In their positively wonderful book Misfit Monsters Redeemed, several unpopular and long-forgotten monsters are updated and retooled for the modern gaming environment in ways which, surprisingly, I wholeheartedly approve of. Lurkers, Trappers and Executioner's hoods are among these privileged few, now elegantly merged into a single species. Trappers, the immense and intelligent reproductive females, now gain suckered tentacles and vicious teeth, but are still described as having flat, slab-shaped bodies. 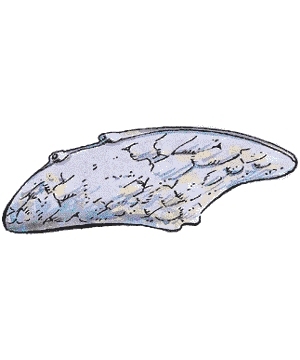 The new Lurkers, despite their illustration, are still said to be ray-like in form, apparently just fluid enough to fold into a false stalactite or other rocky formation. Fairly similar to the Darkmantle and perhaps not quite as cool looking, but I do like the idea of Lurkers and Trappers being two different sexes of the same monster. Where this update truly shines, however, is the new Executioner's Hood, now considered a larval Lurker, and just look at that little beauty. The toothy grin, the pit-like eyes, the tentacle coming out of its nose-hole...I'm downright jealous of this ghoulish little design, it's perfect, and I love the book's description of it hanging from cave ceilings like a "shapeless pod." That's even better than a fake stalactite! I am all about shapeless pods! I definitely enjoy the visual of dangling, slimy sacs opening up their fangly maws as they rain down on an unsuspecting party. Overall, I've always enjoyed the idea of floors and ceilings that eat people, and while I'll always miss the Lurker's simple, buggy-eyed sheet design, I have to admit that the evolutionary course these monsters have taken continues getting cooler and scarier.